We’re refreshing our Transport Strategy to set ambitious targets for improved outcomes to 2050. With the daily population in the city forecast to increase from 911,000 today to 1.4 million by 2036, bold decisions will need to be made about how space is designed and used in the future. We need to change the way we plan, operate and think about transport to ensure our city remains a great place for people. The new Transport Strategy will be a 10-year document with a 30-year vision to guide our decision making on transport, which will include ambitious targets to align with Council goals. 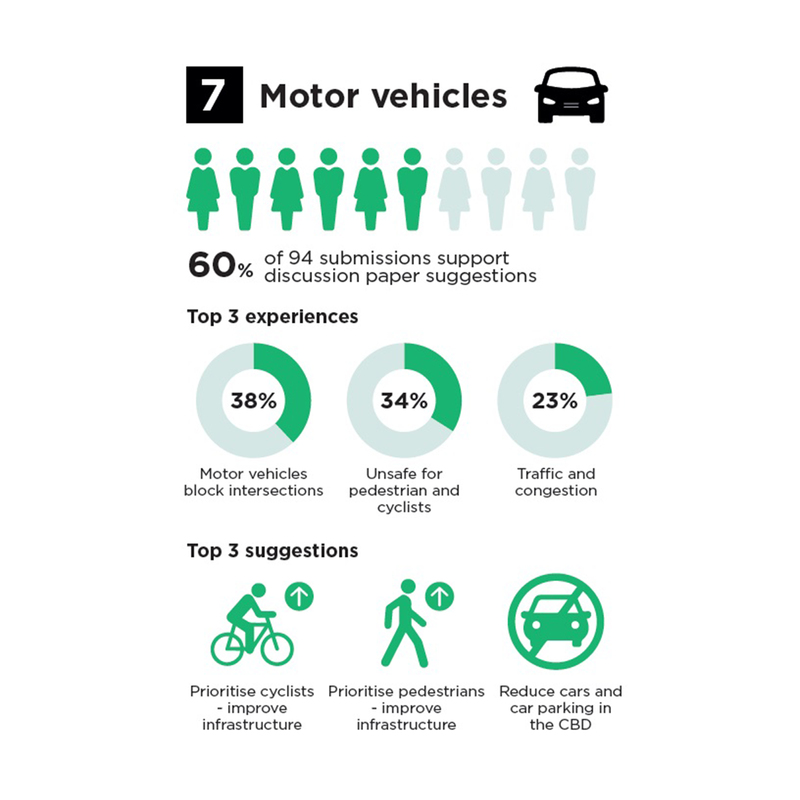 Eight discussion papers were released from April to July 2018 to encourage community debate and gather feedback to inform the City of Melbourne’s draft Transport Strategy. The feedback submitted during the community consultation has been analysed by EY Sweeney. 74% of 197 submissions support discussion paper suggestions. 80% of 80 submissions support discussion paper suggestions. 63% of 128 submissions support discussion paper suggestions. 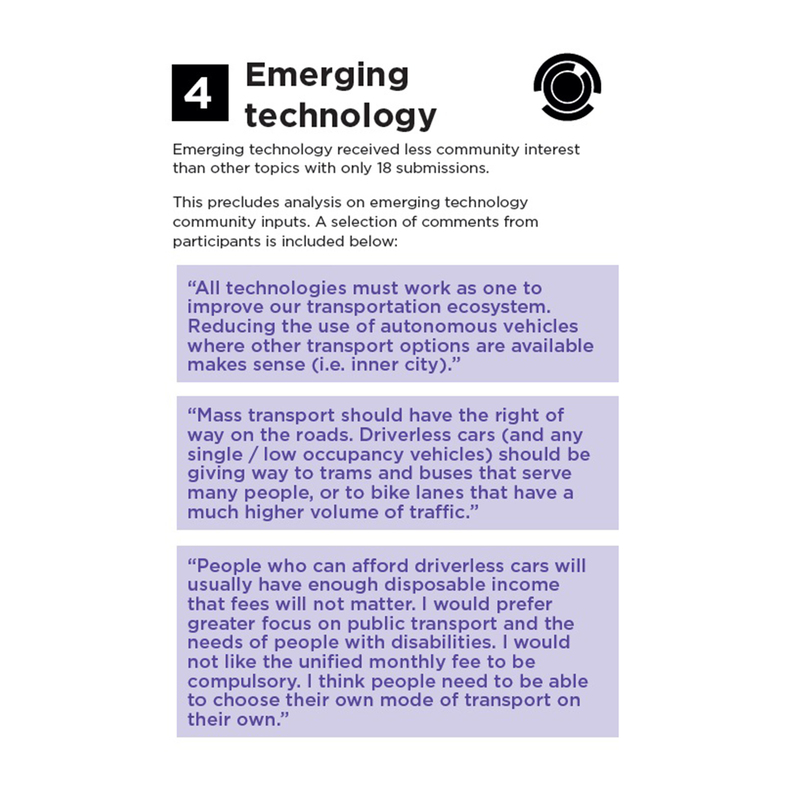 Emerging technology received less community interest than other topics with only 18 submissions. This precludes analysis on emerging technology community inputs. 90% of 366 submissions support discussion paper suggestions. 67% of 91 submissions support discussion paper suggestions. 60% of 94 submissions support discussion paper suggestions. 44% of 39 submissions support discussion paper suggestions. 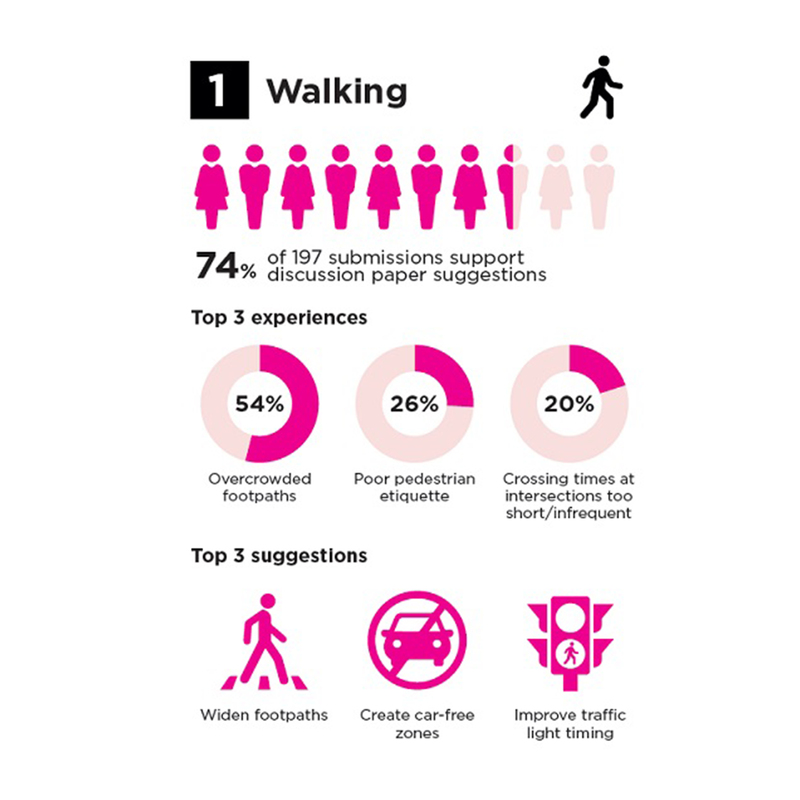 more than half of respondents (54%) to the Walking paper said they had experienced ‘overcrowding on footpaths’. top experiences were ‘poor pedestrian etiquette’ (21%) and ‘crossing times at intersections too short/infrequent’ (20%). main suggestions to combat overcrowding and etiquette were to widen footpaths (27%), create car free zones (24%) and improve traffic light timing (18%). The discussion themes cover evidence, best practice from other cities, options and ideas. 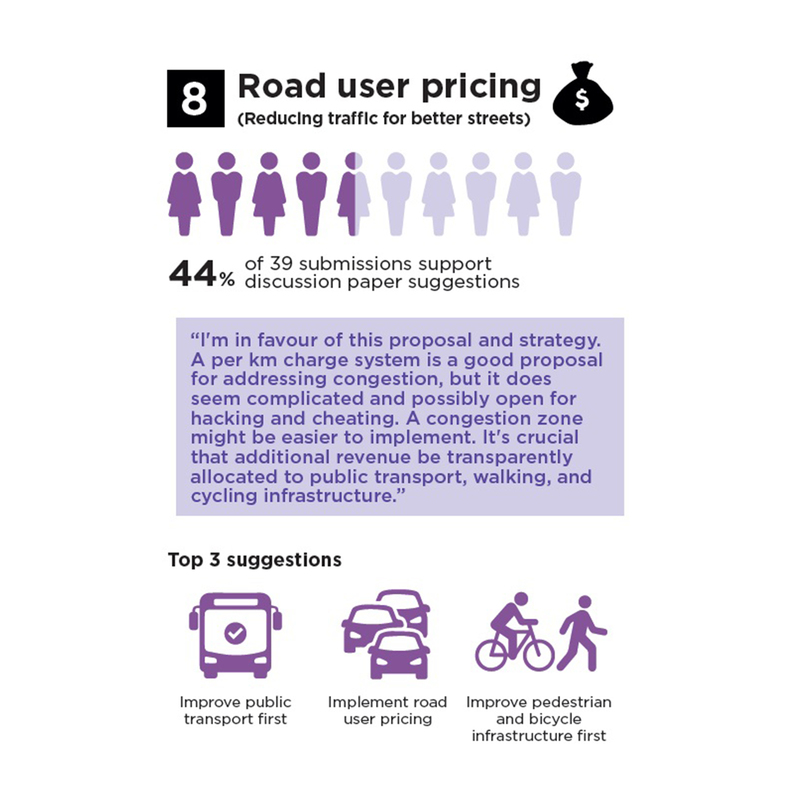 What are the most important issues for the Transport Strategy refresh to address? 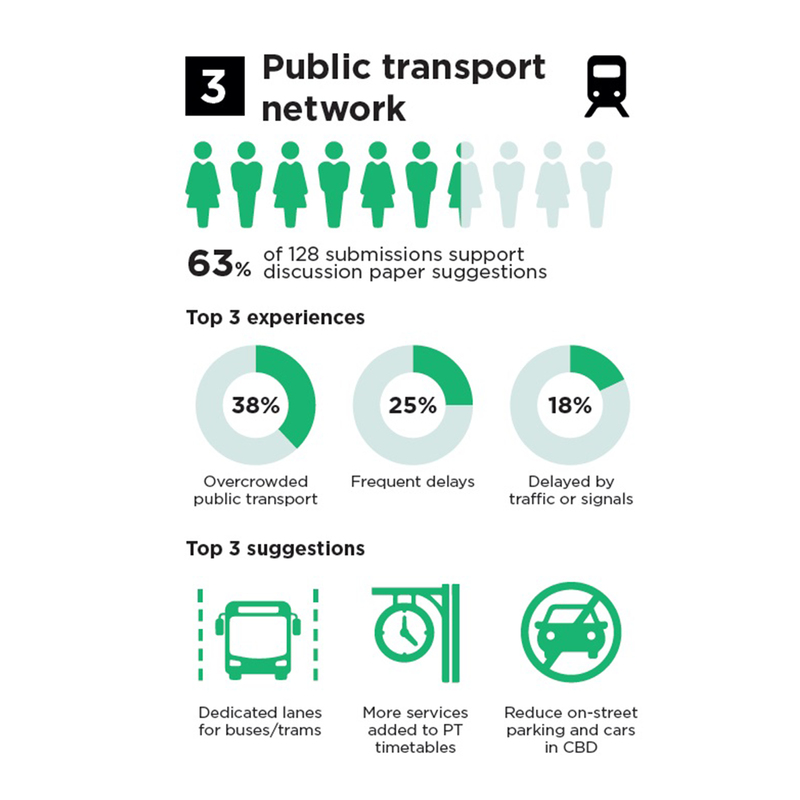 Key issues and ideas to begin a conversation about transport. Capture feedback to inform the draft strategy. Publish draft Transport Strategy. Consultation with community and stakeholders to inform the final Transport Strategy. Final Transport Strategy delivered to Future Melbourne Committee for endorsement. Over the last 30 years, the City of Melbourne has improved the quality of our streets creating vibrant, productive, inclusive and enjoyable places. Our streets are critical to the city’s liveability, environmental sustainability, economic prosperity and international reputation. We have created more places for walking, shopping, sitting, connections for business and dining by repurposing excess road space. Activating our laneways and building frontages via the introduction of exemplary policies, transforming our city into a wonderful place to live, work, do business and visit. Prioritising walking as the number one mode of transport, supported by public transport and cycling. Improvements have seen these modes grow strongly while the importance of cars has declined. The City of Melbourne has led the way in prioritising walking as the number one mode of transport in our city, supported by cycling and public transport. Key strategies include Transport Strategy 2012, Walking Plan 2014, Places for People 2015 and Bicycle Plan 2016. This will continue to be our focus as we refresh the Transport Strategy in 2018. While much has been achieved, Melbourne is facing significant change over the next 30 years including substantial population growth. In the next three years, the number of people in our municipality on an average weekday will exceed 1 million and is forecast to grow to approximately 1.4 million by 2036. 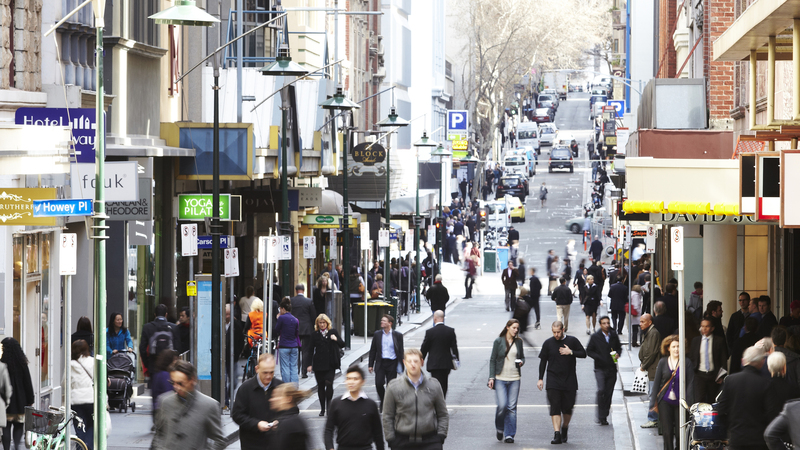 By 2051, Greater Melbourne’s population is expected to grow by almost 80 per cent, from today’s 4.5 million to eight million people. Overcrowding of footpaths, particularly at major traffic intersections. People struggle to fit on the footpath in a number of places. This presents a major safety risk and negatively impacts the city’s liveability, reputation and economic prosperity. More time waiting at intersections means less time in shops, cafés and restaurants and doing business. Escalating pressure on our public transport system, which is already under strain. Whilst the Melbourne Metro project will play a critical role in unlocking capacity in the city’s rail system, the network will be overcrowded again shortly after its completion. Traffic congestion continues to increase in the inner city and middle ring neighbourhoods surrounding the central city. The city’s urban renewal areas are developing quickly and quality public transport connections have not yet been committed. Under-representation of bicycles in the city. 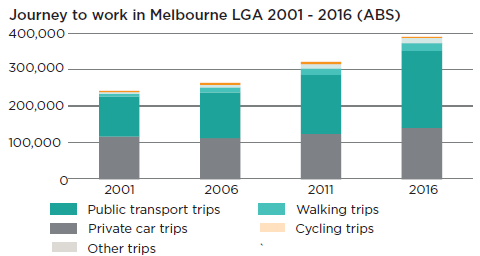 Cycling to Melbourne grew strongly from 2008 but growth has since stalled. Low occupancy of some on-street car parks, excessive provision of off-street parking and competing demands for city space e.g. public spaces, trees, landscaping etc. The opportunities and challenges presented by emerging technologies including automated vehicles and drones. Responding to disruption from major infrastructure projects to ensure that when infrastructure is reinstated we take the opportunity to plan for future transport and public space needs. Adapting the transport system to increase resilience in response to climate change and reduce emissions. Ways to reduce the risk of attacks on pedestrians by hostile vehicles. Ensuring that our future streets remove barriers to inclusion so our city is comfortable, accessible and attractive for people of all abilities and ages. What is City of Melbourne doing? What is the Transport Strategy? 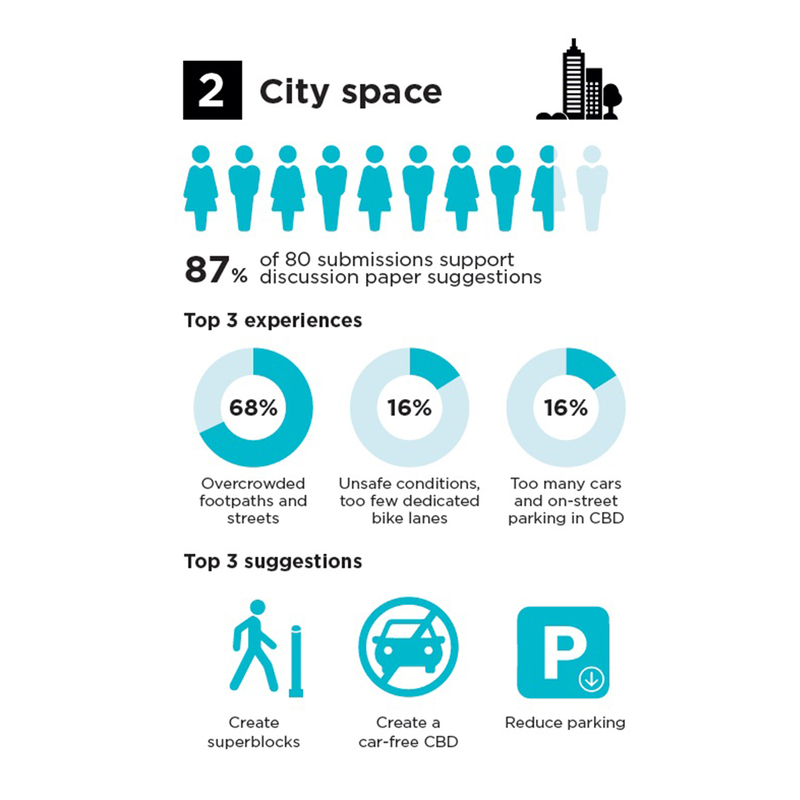 What is the City of Melbourne’s role with transport? The City of Melbourne is developing the 2018 Transport Strategy, which will guide future transport related decisions to protect the liveability, reputation and economic prosperity of our city. The Transport Strategy is a document which sets out a long-term vision for the municipality and sets the future direction of transport in the City of Melbourne. It uses an evidence-based approach, examining current and future transport capabilities, conflicts and issues to inform the strategy. The Strategy will consider the broader context of the city, focusing on key issues which must be addressed to ensure prosperity and liveability for decades to come. City of Melbourne has a defined transport responsibility. It is important to note that many aspects of the transport system within the municipality are not under Council control. City of Melbourne works collaboratively with transport agencies, authorities and operators including Transport for Victoria (TFV), Public Transport Victoria (PTV), VicRoads, Yarra Trams and Metro Trains. Why is the Transport Strategy important? The Transport Strategy is an important Council document with a long term 30 year vision, setting the goals, policies, priorities and actions for the next 10 years. Preparing the strategy provides the community with the opportunity to contribute to this decision making tool and associated policies. 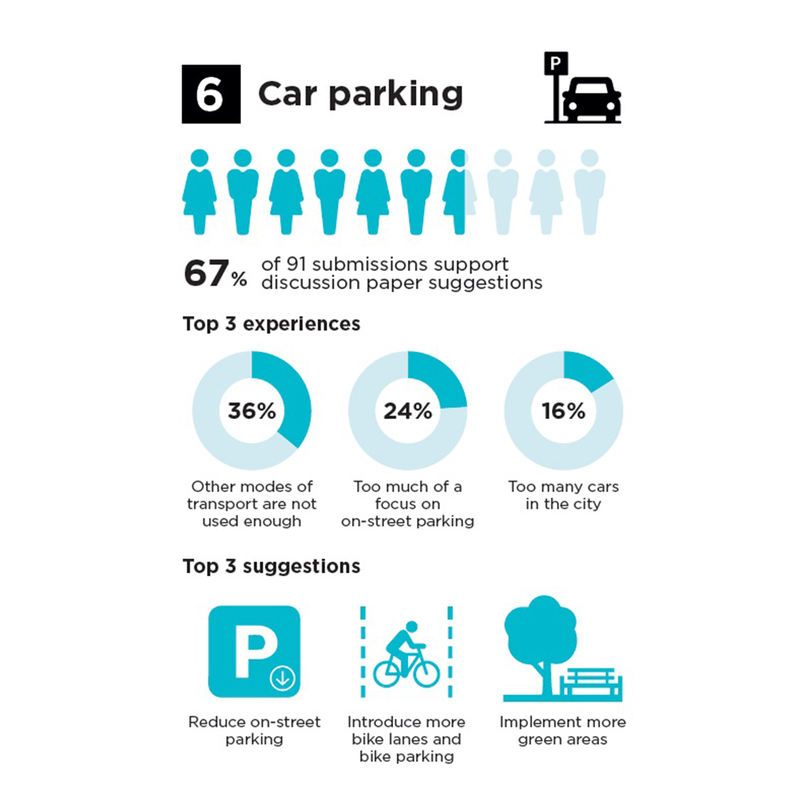 Does the Transport Strategy provide opportunity for community feedback? Yes it does. 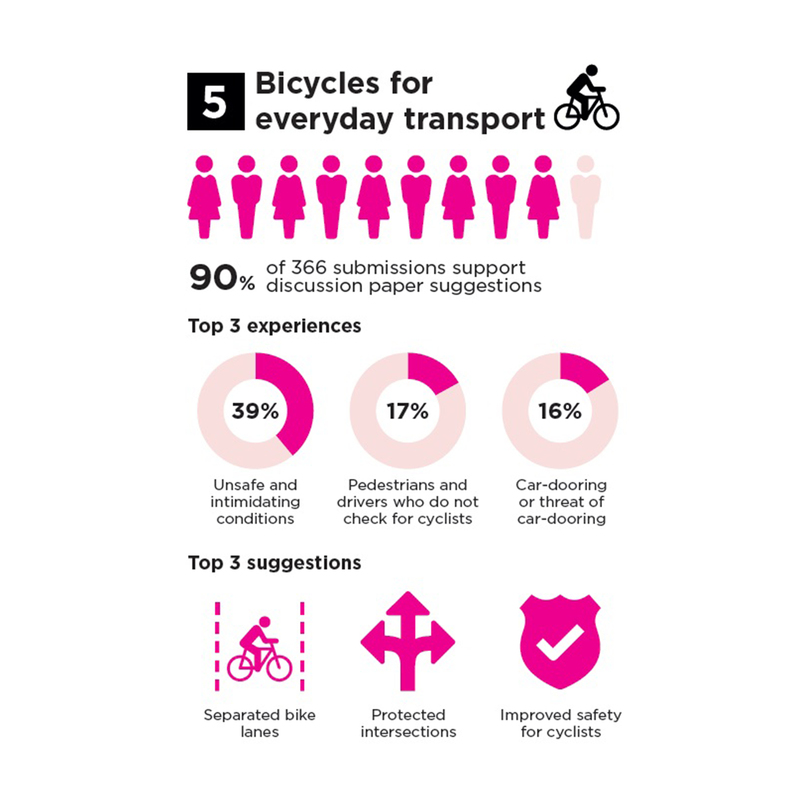 The City of Melbourne is commencing online engagement to allow community input in the development of the 2018 Transport Strategy. Every community member has day to day experience with transport within the municipality borders, and we believe these experiences are significant in helping to identify and address current and future transport issues. When will the 2018 Transport Strategy be completed? The new Transport Strategy will be delivered to council for endorsement in the new financial year.